What is the difference between university-program accreditation from the ABAI Accreditation Board and course-sequence approval by the Behavior Analyst Certification Board (BACB)? The purpose of accreditation is to promote quality control within the discipline’s training programs. This is accomplished when eligible programs periodically complete a comprehensive self-study and submit to a site visit conducted by trained peers to determine whether the program meets certain standards of excellence. Accreditation is specifically designed to convey information about a training program’s comprehensiveness, rigor, and quality. The ABAI Accreditation Board standards are comprehensive and involve evaluating the quality of all aspects of training programs undergoing review. This includes evaluation of the program’s mission, curriculum, outcomes assessment, administration, resources, public disclosure, and degree programs. The Behavior Analyst Certification Board’s (BACB) Verified Course Sequence (VCS) system does not constitute program accreditation, by design. The VCS system is simply a way to recognize educational institutions that teach the coursework required for specific BACB credentials, primarily as an effort to expedite the application process for credential candidates. According to the BACB, this administrative designation does not convey any information about the comprehensiveness, rigor, or quality of training programs. Even when a training program already includes course-sequence approval from the BACB, accreditation would allow the program to convey to the public that it has met standards of excellence as determined by the ABAI Accreditation Board. Why was the Association for Behavior Analysis International's (ABAI) previous accreditation system replaced by the ABAI Accreditation Board? The ABAI Executive Council plans to pursue recognition for its accrediting body from the Council for Higher Education Accreditation (CHEA). CHEA is the only non-governmental organization that recognizes accrediting bodies and counts some of our largest professional organizations and institutions as members. Becoming a CHEA-recognized accrediting body is another step toward further legitimizing our profession. However, CHEA recognition is an extensive multi-step process requiring careful adherence to CHEA's standards. In Fall 2015, the ABAI Executive Council formally voted to establish the new accreditation board in an attempt to restructure its accreditation system so it was better aligned with CHEA's eligibility and recognition standards. ABAI Accreditation Board is not currently recognized by CHEA and it still must take a number of steps before even submitting an eligibility application. However, the establishment of ABAI Accreditation Board is a very large step towards this goal. With the establishment of the ABAI Accreditation Board, what will happen to the accreditation status of programs accredited by the Association for Behavior Analysis International (ABAI) Education Board? The ABAI Accreditation Board remains under the aegis of the Association for Behavior Analysis International and is the successor organization of the ABAI Education Board. Additionally, the ABAI Accreditation Board current coursework accreditation standards are the same as the previous accreditation coursework standards under the ABAI Education Board. As such, any programs currently accredited by ABAI are now accredited by the ABAI Accreditation Board. Programs accredited under ABAI's previous system will remain on the same accreditation cycle. However, when a program applies for re-accreditation it will do so under the ABAI Accreditation Board's updated accreditation framework. Additionally, effectively immediately, currently accredited programs are expected to submit their Accredited Program Annual Report Forms using the ABAI Accreditation Board's new reporting format. How is the ABAI Accreditation Board different from ABAI's previous accreditation system under the Education Board? A number of significant updates were made to ABAI's accreditation system with the establishment of ABAI Accreditation Board. Perhaps the largest change is that accreditation decisions are no longer made by the ABAI Executive Council. Instead, ABAI Accreditation Board operates as an independent body within ABAI and ABAI Accreditation Board Members are charged with making all decisions related to accreditation. This includes decisions about which programs meet, and do not meet, the ABAI Accreditation Board's accreditation standards, the policies and procedures used to govern the organization, and the process used to update accreditation standards. Another change to the accreditation system is the introduction of a fee schedule. 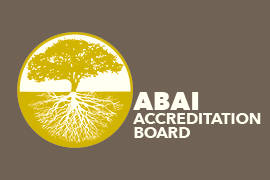 ABAI Accreditation Board currently receives financial and administrative support from ABAI until it is able to sustain its operations independently. The introduction of a fee schedule puts ABAI Accreditation Board on par with accrediting organizations in other fields and will allow ABAI Accreditation Board to pursue its mission. Other changes introduced with the establishment of ABAI Accreditation Board include new policies and procedures related to accreditation and becoming a ABAI Accreditation Board Site Visitor. These updates do not include any changes to the previous accreditation coursework standards, however, they do tighten the accreditation process and are designed to align ABAI Accreditation Board with the standards required for CHEA recognition. Are ABAI Accredited Masters-Level programs required to have a traditional thesis structure (e.g., committee, defense, etc.)? The ABAI Accreditation Board allows each program to determine the number of contact hours assigned to the thesis or equivalent standard. However, programs are not allowed to use the same contact hours across standards. In other words, a program would not be able to use a project completed during another course to fulfill the thesis or equivalent standard if the contact hours from that same course are also being used to meet another coursework standard.